According to the Centers for Disease Control and Prevention (CDC), cardiovascular disease including heart disease, stroke, and high blood pressure is the #1 killer of women and men in the U.S. Men are more than twice as likely as women to die from this and there are some major risk factors that you can control so as to take preventative measures. They include: diet, exercise, tobacco use, obesity, hypertension or high blood pressure, high cholesterol, and diabetes. A few strategies to try so as to create lasting positive change are: exercise, eating healthy, maintaining a spiritual practice, and having regular checkups with your doctors. 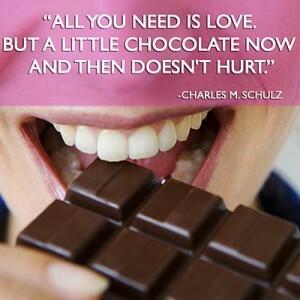 In reality dark chocolate can make your life healthier and happier. Dark chocolate (70% or higher cacao) may lower your risk of heart disease by reducing blood glucose and bad cholesterol while boosting levels of good cholesterol. Chocolate contains flavanols, which have antioxidant and anti-inflammatory properties. Therefore my prescription to you this February is treat yourself to an ounce of dark chocolate (70% or higher cacao) a few times a week and enjoy showing yourself (and your heart) some love.